On Valentine’s Day last week, two very different scenarios in the Dog World played out on a local and national level. While a special Hearing regarding “Puppies Galore,” took place in Brick Township, NJ, some of the nation’s’ Top Dogs, representing the finest of their breeds and groups, pranced at Madison Square Garden in New York City, just over an hour’s drive from Brick, vying for the title of Best-In-Show. At the former, the Township Council responded to multi counts of animal abuse leveled at the owners of the recently closed, “Puppies Galore,” Nat Sladkin and Maria DeSantis. (please see previous post for details). Much to the satisfaction of those who had brought about the closing and those attending the hearing, the shop’s business license was permanently revoked and it was announced that the Council would now seriously consider the banning of all retail pet shops in Brick Township, like an establishment called, “Puppies,” located just miles from the Sladkin/DeSantis operation. According to many, you didn’t have to be a health inspector or an officer of the law to know something was amiss at, “Puppies Galore.” Some said it literally didn’t smell right, and when a puppy was seen roaming freely in the store after business hours, a well-orchestrated investigation brought about its ultimate closing. I’ve had people say to me, “At least Puppies (the other shop) is clean and pleasant.” But this is merely a sanitized facade that hides the very dirty and unpleasant behind-the-scenes business of dog retailing at the commercial level. On many levels, the AKC has done a lot of good for dogs for several generations. It educates humans about the purposes for which dogs have been bred, which in turn can create better canine-human bonds, it creates jobs and promotes a dog-centric community of like-minded individuals. I personally know people who are actively involved in breeding and showing dogs as well as covering AKC events, from the big show at The Garden, to helping to promote the role of Service Dogs. Some of them do a lot of good work on the behalf of homeless dogs, too. But the AKC needs to do more on behalf of ALL dogs to be viewed as a truly dog-positive institution or risk losing the respect of many dog-loving Americans. I fear much damage has been done. Many purebred pups, pumped out by greedy uncaring Commercial Breeders come with AKC papers. Why? Because all the AKC requires of these breeders is the stipulation that the parent’s of their pups are Purebreds. According to Janice Fisher, an organizer of Peaceful Protests outside dog retail shops, each time these transactions take place, the AKC makes a profit. You don’t need a calculator to see that huge sums of money can be made. American puppy shops are now filled with registered purebreds, many that will end up in shelters because of health and temperament issues and because it is just so darn easy to plunk down one’s money to get the dog you want, when you want, without much thought. Even those who may not like the Pedigree dog food brand, have to admire the corporation’s effort to encourage adoption in their Westminster Ad Campaigns, but until the AKC helps to curb the flood of these sick and neglected pups, it is a vicious cycle. Think about it. I am not against hardworking and devoted breeders. Although my pets have come to me in many different ways, I am currently the proud Human to a Portuguese water dog who was brought into this world by one such individual. Hooper is ten, but looks like she is three, and has actually been fed Pedigree for a number of years. Although I could have, I never got around to officially registering her with the AKC, it really wasn’t important to me. I hope to be able to adopt another dog when the time is right. I think we’ve made some great strides in the housing of homeless Companion Animals, but most agree we need shelter reform, if not a revolution to truly make things better for them. In our shaky economy, there are many heartless scammers turning the adoption process into a money-making business, too, in some areas of the nation. (More on that in a later post). Puppy Mill awarenss and is an area where the AKC can help by using its clout to become a positive force. There was a final twist in the Westminster saga. After winning his title of Best-In-Show, Malachy the Pekingese was told that he could not have the longstanding traditional winner’s dinner at Sardi’s Restaurant due to a ruling of the NCY Health Department. It looked like Malachy would have to settle for dare we say a bowl of Pedigree, until the ruling was reversed by Mayor Bloomberg. Malachy had his day and gourmet meal after all. But I would love to think, that if this Top Dog could talk, he might just ask his humans, and the Sardi’s staff, to wrap up a few million meals to go to share with his friends that, well, just aren’t such lucky dogs. Update – February 17 – I am on the road and my internet access will be limited until March, but I wanted to follow-up on the Hearing of the Brick Township Council on February 14th, regarding ,”Puppies Galore.” According to Courtney Fisher Keys, the business license for Puppies Galore has been permanently revoked in the Township. Furthermore, the Brick Township Council is looking into an ordinance that would ban all retail pet stores in Brick Township. 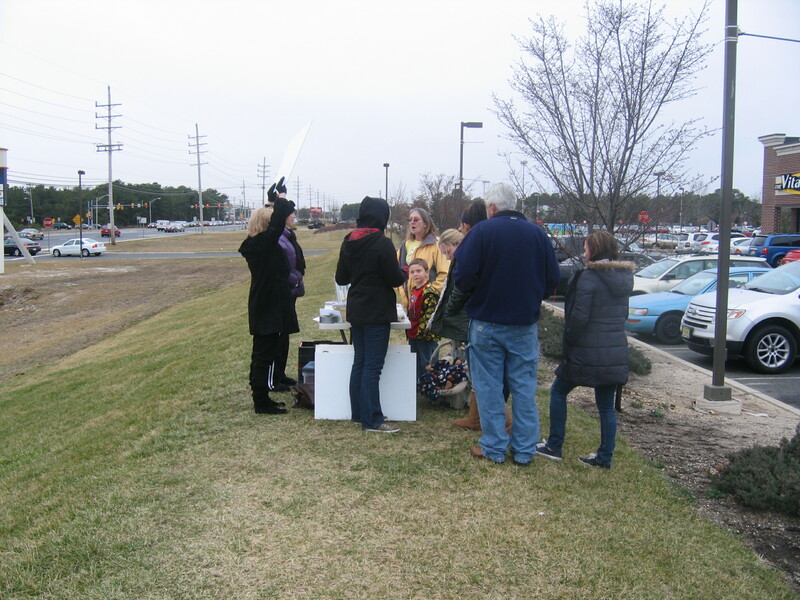 Courtney, and her group of Peaceful Protestors, are planning another demonstration outside PUPPIES in Brick on Rte. 70 (in the strip mall next to Target) on Saturday, March 3rd at noon. Puppies Galore had opened in late fall, sandwiched between a diner and a bakery in a strip mall on Route 70. Sladkin, as many locals might recall, is the former owner of the now defunct Puppy Depot in Point Pleasant Beach, just a short drive from his recently shut-down operation in Brick. Among the responders on the Patch article comment thread was Janice Fisher, a woman who with her family and friends has been arranging Peaceful Demonstrations outside of these establishments in Ocean and Monmouth Counties. 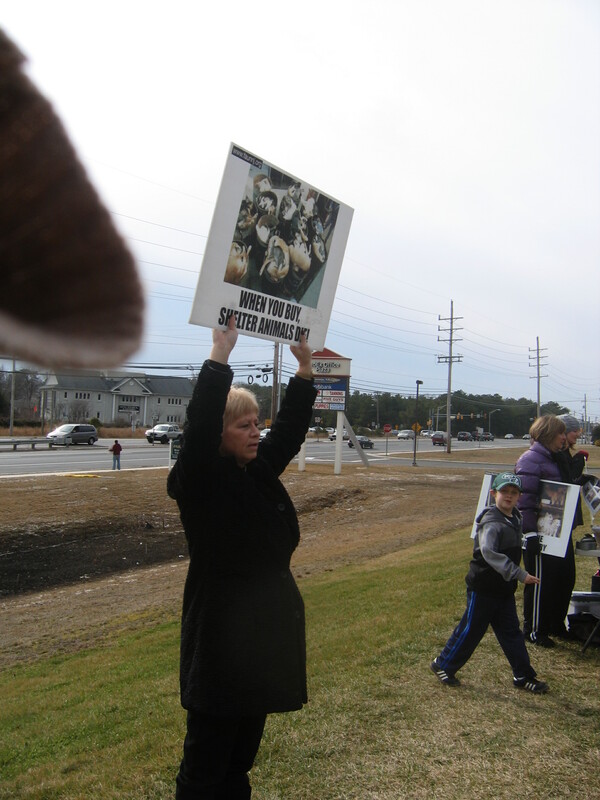 Janice explained that there was a demonstration planned for outside another puppy retailer just about a mile down the road (owned by another party) also located in a strip mall next to Target on Route 70. As I had wanted to attend one of these events, I said I would be there. The day was damp and cold, but it didn’t squelch the enthusiasm of Janice and her crew. When I arrived, they told me where to park (part of the police ordinance calls for the participants not to take up parking spaces needed for customers of all the shops) and what line not to cross (a spindly tree which we were not to step beyond). Janice commented on the low turnout noting some members of their group were protesting a similar establishment up in the next county. 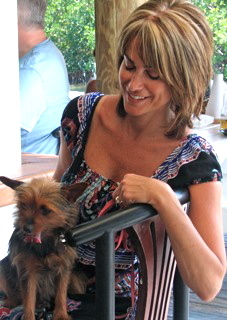 Last December, I had interviewed another protest organizer, Jacki Flanigan,https://nationaldogweekbook.wordpress.com/2011/12/22/be-aware-of-where-you-get-your-dog/ I had been told that there was a certain protocol to follow; sign holders could not use abusive or threatening language toward customers visiting the Puppy Shop and must maintain a designated distance from the store’s entrance. 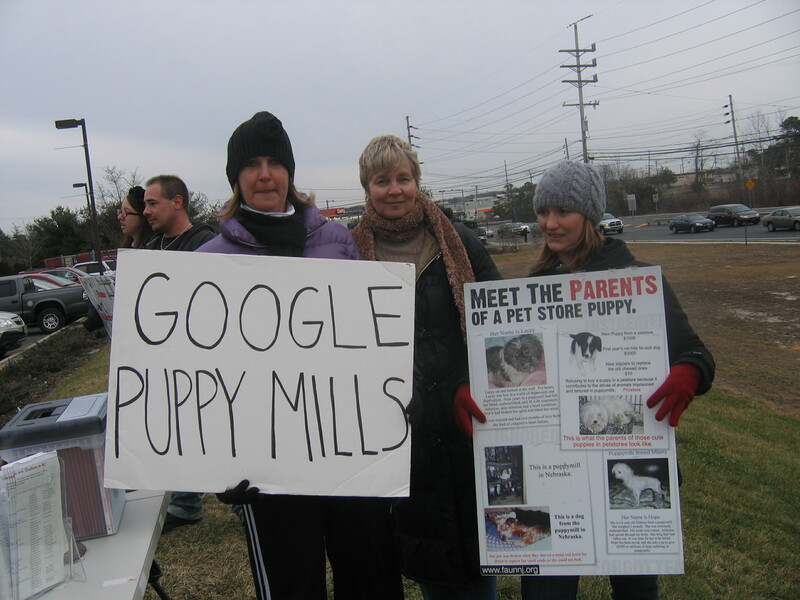 Janice also offered participants ready-made signs that read, “Google Puppymills” and others that announced, “Meet the parents of your Puppy.” They also handed out literature and presented photos of what really goes on at the mills across the country. 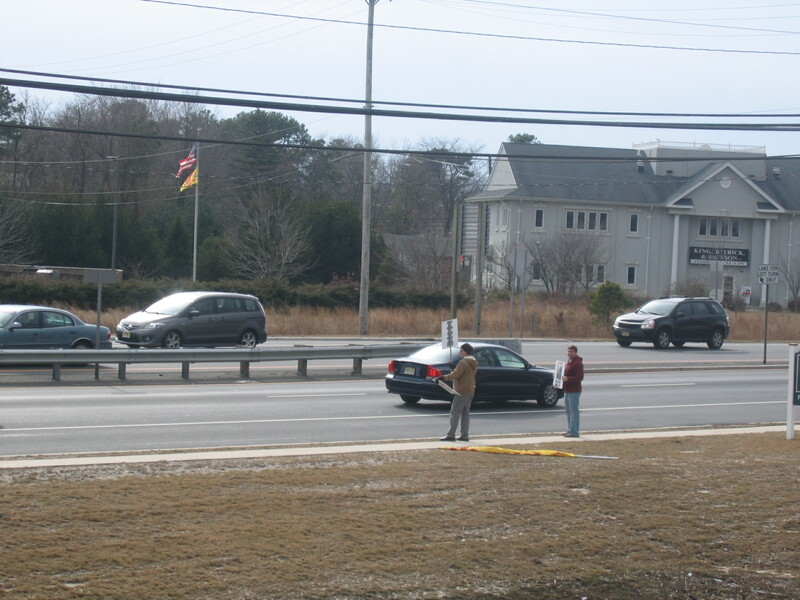 As Janice, husband Dave, daughter Courtney and her husband, held signs with about four other protestors, near the busy road, many cars honked in support as they passed. 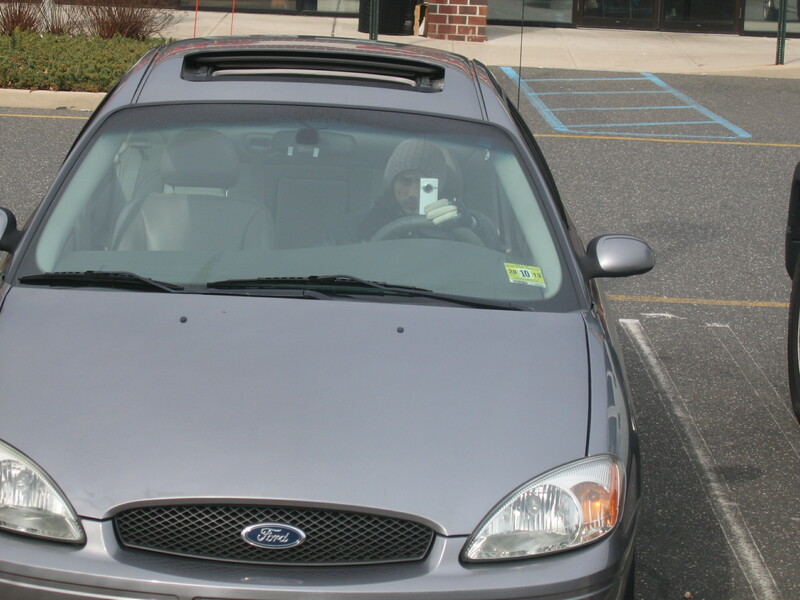 Before long, I noticed a young man sitting in a small gray car directly in front of the information table. He sat quietly in a knit cap, cigarette in one hand, camcorder in the other. Janice explained he was working for the store, recording every move and action of the protestors. Despite this, in my two hours there, I saw two pups being carried out of the store. Families averted their eyes from the protestors, but some of the young children peered over their shoulder, curious to know what was wrong. Hopefully, their puppy will be healthy, but perhaps they may at a later time investigate for themselves. Still other groups of people came up on the hill to talk to Janice and Courtney, genuinely interested and some appearing shocked. “What does the staff tell their customers about you?” I asked Janice. “They tell them we are just crazy or we are protesting fur,” she replied. I spoke to a number of people who had acquired their puppies from this shop owned by Lorin Kisland, a man associated with a couple named Bauck who are well-known “players” in the mill trade with a long. (Google away here).They spoke of health issues, ever-growing vet bills and the indifference and lack of responsibility on the part of the shop’s management. The stories I heard and the revolting photos I saw were enough to make anyone who claims to be an animal-lover get up and do something. It is estimated that 90 percent of all of these pups come from puppy mills. According to Janice, people often learn their dog is a mill pup only after having signed the purchase contract. To those who claim their purchased pup has a certificate of pedigree (making all legit), yes, it may, but the AKC only requires that the parents of the pup are purebreds, (that is the only “standard” requirement), and make $25.00 for each certified pup. – You MUST contact the ocean County Board of Health – (732) 341-9700. You can report your case to Pet Watch NJ by going to www.pwnj.org (they keep records of all pet store complaints in the state for consumer education). All others should inquire of similar options available in their own states. I know this is a very brief post about a very big problem. Janice’s group will be at the same location on Saturday at noon. There is also a scheduled hearing about the fate of these retailers in Brick Township to be held on February 14th. If you wish to receive more information: JFDF2@optonline.net. 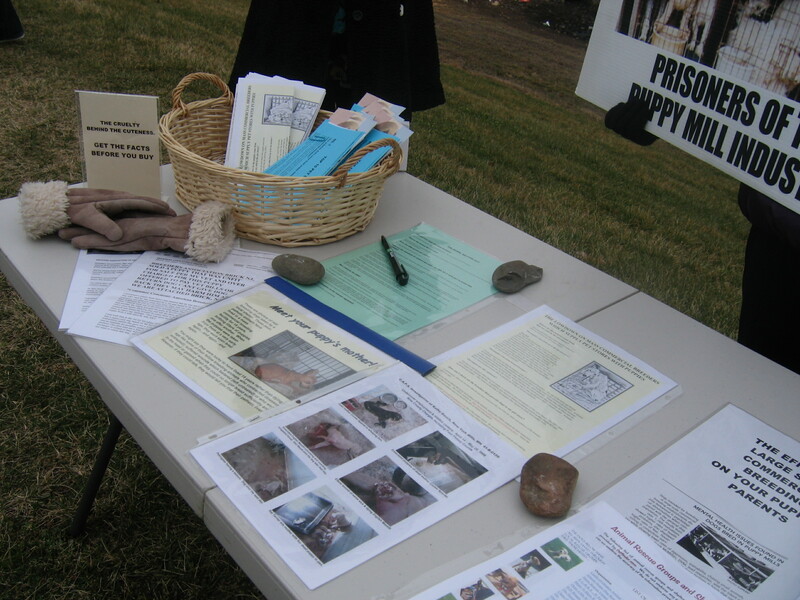 During National Dog Week, 2010, the Mayor of Brick, Stephen Acropolis, declared Brick Township a National Dog Week Community at the town’s First Dog Fest in front of an appreciative dog-loving crowd. 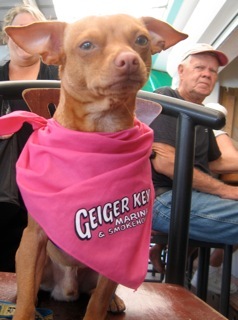 I know he is on the side of man’s best friend and I am hoping he will rid this town of these establishments. As for the thirty-nine sick puppies, they have received the proper medical treatment and are being housed at three different shelters. 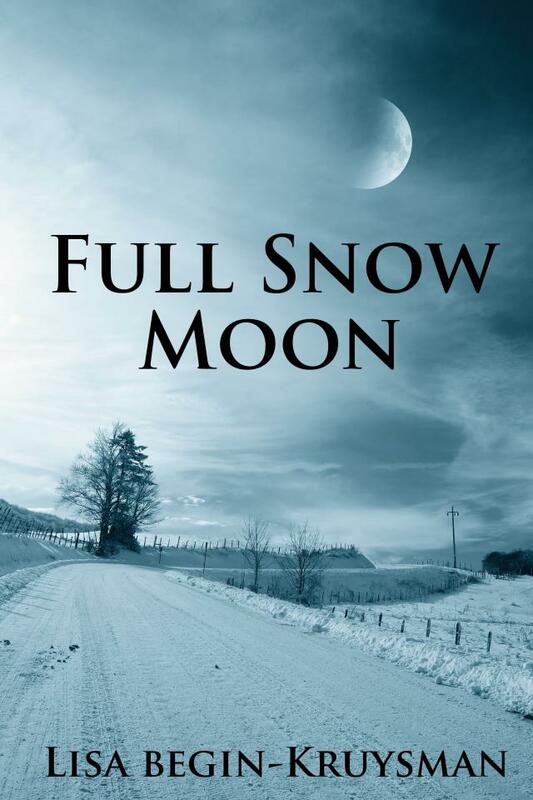 As the Full Snow Moon rises in the February sky, today also marks the 200th anniversary of the birth of Charles Dickens…so I lead with one of his quotes because it suits this post perfectly…. As some of you know, February is Spay and Neuter Awareness Month. My last post discussed the work of the group Project Pets – Spay , Neuter, Love. https://www.facebook.com/#!/pages/Project-Pets-Spay-Neuter-Love/160594203971240 I hope you will join them as they continue their humane work. It truly is the new face of Rescue. 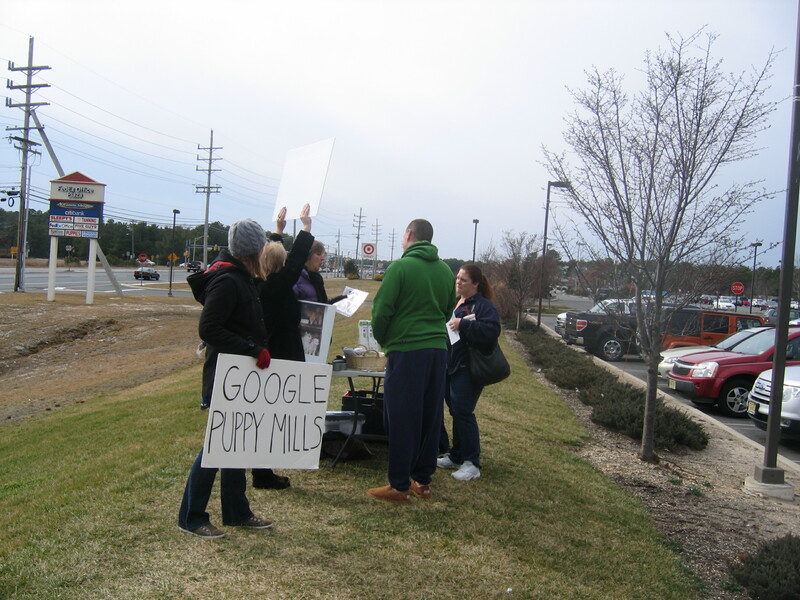 I have so much to post about, among them, a “report” from a Peaceful Protest against a Puppy Retailer in my town (and coverage of the closing of the deplorable Puppies Galore in Brick, NJ), http://brick.patch.com/articles/officials-remove-sick-puppies-from-brick-pet-store?ncid=following_comment and one about the terrific work some young people are doing on behalf of homeless animals and more. Of the first, it is amazing how so many I talk to are so unaware of the scope of this problem. It is a bad situation that harms animals and humans, please take my word for it. There have been many developments on the writing front and it has been difficult to keep up…but I will. 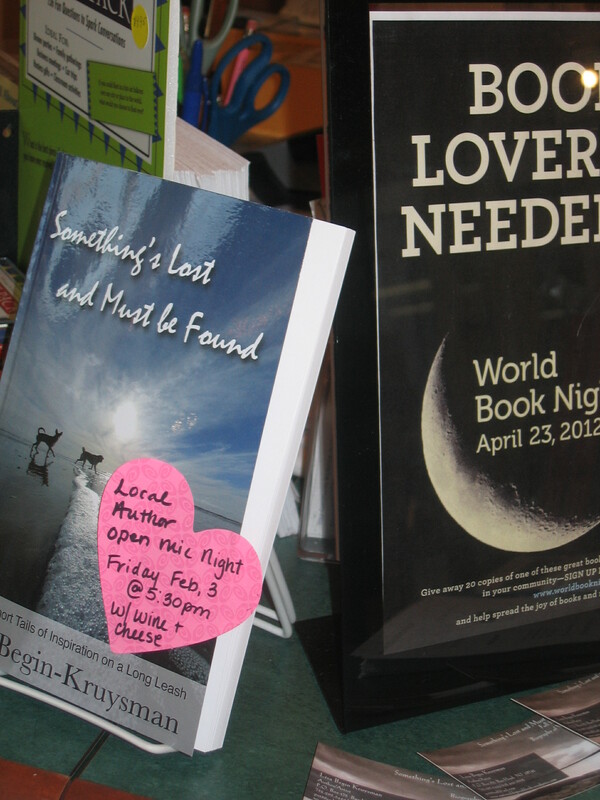 Last Friday evening, I experienced my first author appearance for my short story collection, Something’s Lost and Must be Found. http://www.amazon.com/Somethings-Lost-Must-Found-ebook/dp/B0051ZMYG2 This “little” book was Midwest Book Reviewed last November, was e-reader news today’s Book of the Day on December 5, 2011 and received a three-part review by Teddy Hilton Blogger, Dr. Patrick Mahaney. It was offered in a soft cover version in January. It would make a terrific and affordable Valentine’s Day Gift for any dog-lover, if I may suggest…. 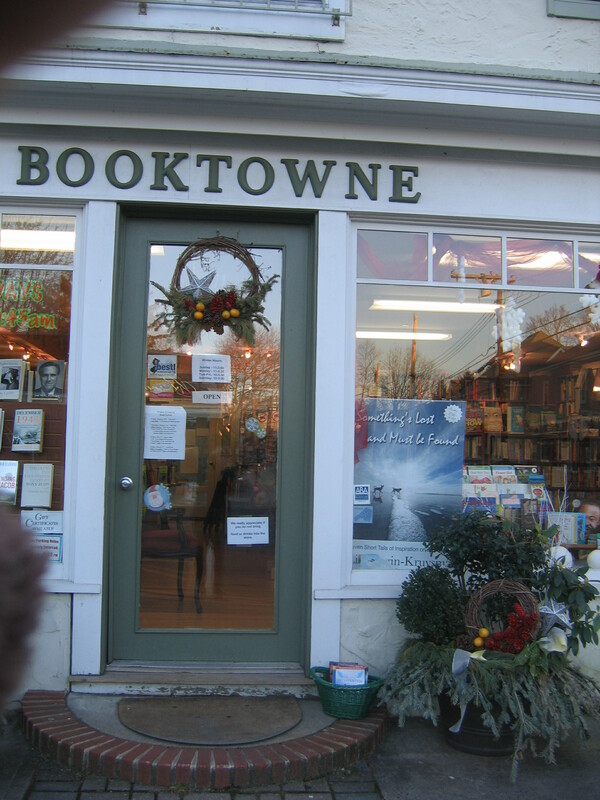 In June, I made a visit to Booktowne in Manasquan, NJ, to meet author Lisa Pliscou (Dude: Fun with Dude and Betty). While there, I got to talk to Maribeth Pelley, the shop’s marketing and public relations consultant. She asked me to contact them when Something’s Lost became a “real” book. I did, and they made good on their offer. We set a date and together publicized and prepared for the event. 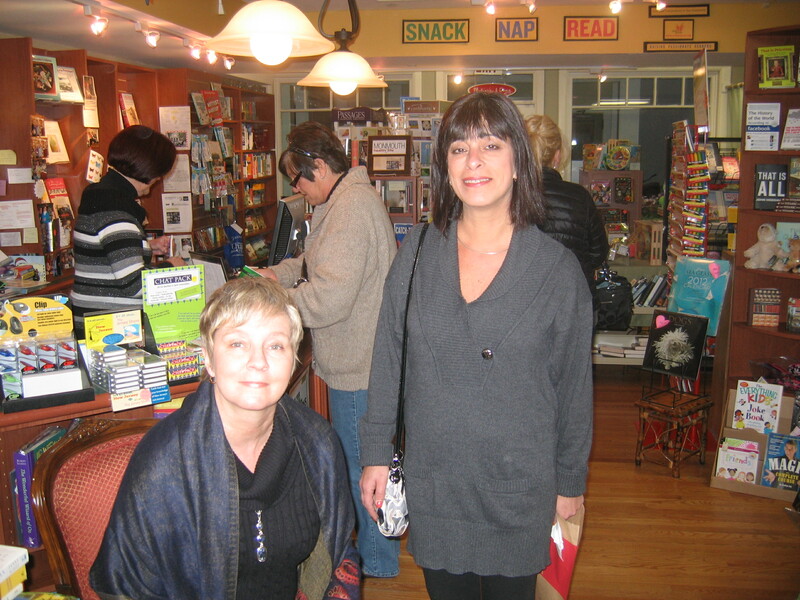 Booktowne owner, Rita Maggio and the store’s manager, Janice, could not have been more helpful. 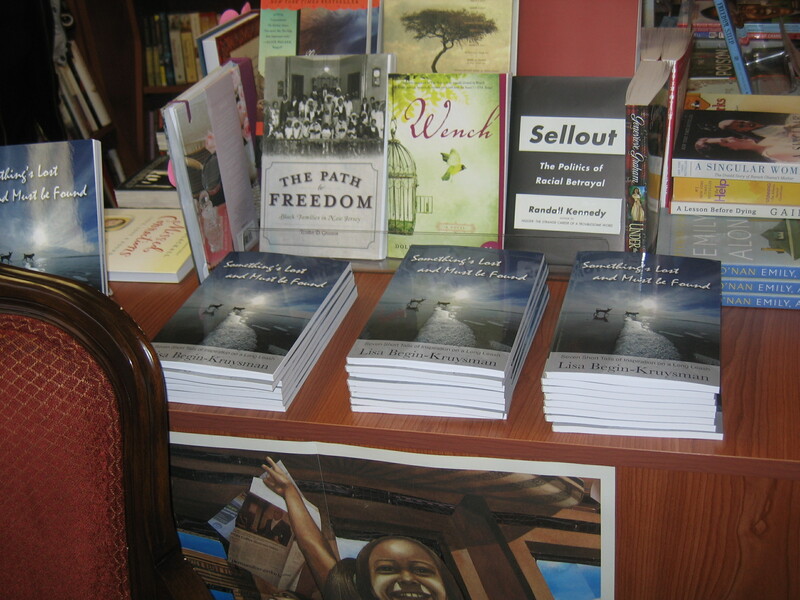 The store is a beautiful place in the quaint downtown section of a historic Jersey Shore town. All three worked so well together to make me, and those who attended, feel very comfortable. It was a successful event all round. I read an excerpt from the book’s longest (and my favorite) selection, THE HOUSE OF THE HAPPY DOG, talked about the evolution of the NDW Blog and discussed the writing process that led to the publishing of this book and the others to come. I know there are literally millions of blog sites out there and scads of new reading material presented each day on e-readers and in book shops; to be able to personally connect with an audience was a such a rewarding experience. On Facebook, friends, whose distance made it impossible to attend, asked me two questions on-line. First, where do you get your story ideas and how did you start writing about dogs? To the first, I say that I am always “absorbing” material via radio, television, newspapers and conversations. I write these items down and eventually they fall into a “title” that I am in the process of developing. Sort of like a bird building a nest. As for the second question, I have always loved animals, especially dogs. Each day, I see their value as helpmates for humans. They are therapists, service providers, companions, guardians and more. To me, they represent an enormous untapped potential for good, one that we have only begun to tap. To see so many of them abused, neglected and discarded, is truly sad and frankly, mind-boggling. I was inspired to begin writing about this subject when I began researching my book about Will Judy, the man who launched National Dog Week, at the start of the Great Depression, to address this topic. This biography, as yet untitled, will be released sometime in 2013 by McFarland and Company. I thank them for seeing its merit. It is my Valentine to the New Jersey Shore region and the state as a whole. I love the cover the publisher has designed for it, too (see above)! I hope you will be able to read it and review it on my Amazon Page. On March 11 my publisher and I will host a live event on Facebook as an official launch. I will let you all know the details. It should be a lot of fun. I truly hope you will join us!